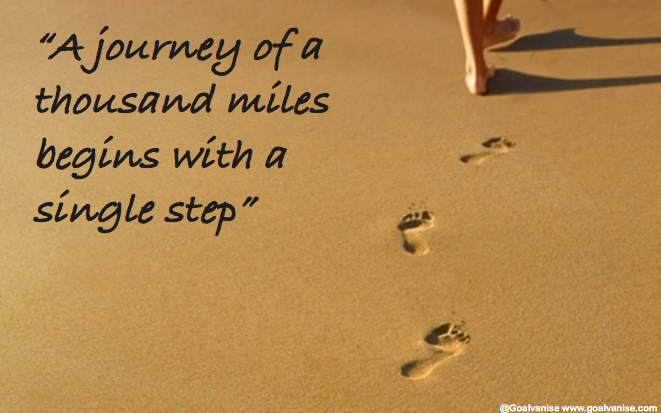 The journey of a thousand miles, as we all know, starts with just a single step. The first step is always the most important. It signals your transitioning from thought to action. And as we all know: no one get celebrated for what they thought about doing or what great plans they had. People are honored for what they did. And it doesn't stop there. Your life changes only when you take action, when you turn your thoughts to actions. Whatever change you want in your life; whatever direction you want your life to go; whatever future you want to create for yourself; whatever legacy you want to leave; whatever impact you want to make; whatever dream you desire to make come true and whatever journey you wish to embark on in life; it all starts with just a single step. And another. I have a book on survival written for soldiers. It is filled with all sorts of tricks of how to survive in any situation you find yourself in as a soldier -- including how to figure out which plants or fruits are edible when lost in a thick forest. There is a chapter in the book titled The Psychology of Survival and it explains how research and history have consistently shown that it is not the strongest who survives the most terrible situations nor the most intelligent nor the most skilled. It is always the one with the strongest will to survive. The one who keeps pushing himself forward and not giving in to despondency. The one who doesn't stop taking a new step, even in hopeless situations. I think life is a war in itself. We are constantly fighting for survival -- to keep our lives, to stay true to the real person within and the survival of our dreams. Every day we are battling to ensure the good within us overcomes the storms we face. And like a soldier, it is not our intelligence nor our strength that will help us the most but our willingness to keep taking a step forward. Your dream, no matter how big, will come true if you make a habit of taking a step forward regularly along the path to fulfill it. Your troubles, no matter how great, are going to succumb if you don't give in to despondency and keep taking a step forward in the direction you want your life to go. Life is meant to be full of interesting journeys. Every goal, challenge and storm you face is a travelling ticket. It's now left for you to take on the journey. To take the first step. And another.